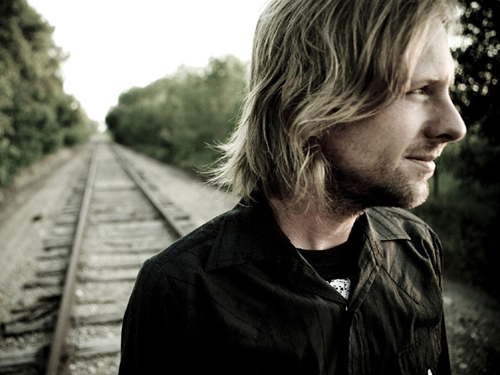 Jon Foreman, lead singer from the band Switchfoot, was forcefully removed from an impromptu after-show concert last night by a police officer. Earlier that day Switchfoot had been performing a concert, as part of their support slow on the Goo Goo Dolls tour, at the Florida State Fairgrounds. Following the band's performance, Jon invited fans via his Twitter page to join him for an after show performance. "Aftershow tonight directy behind the ampitheatre, be there in a 1/2 hour", wrote Jon on Twitter, including a link to a map showing the location. As fans congregated at the chosen spot, Jon performed songs on his acoustic guitar in the semi-darkness. But the performance was interrupted by the arrival of a police officer who forced Jon to leave. "It's over, it's over. Come on, let's go" said the officer. A video of the incident posted by a fan on YouTube then shows Jon trying to shake hands with the police officer, who then uses the outstretched hand to first pull Jon towards him and then push him forcefully through the crowd to end the gathering. Referring to the event later on his Twitter page, Jon wrote "Just got forcefully removed from my aftershow by the police... Officer Fisher grabbed me by the arm and shut us down. Really?!?". Word of the debacle quickly spread on the internet, even leading to respected US news network CNN reporting on the incident. Switchfoot continue their tour with The Goo Goo Dolls through until the end of August.